I went to a tiny little nail salon, in an obscure little mall with the most complicated non floor plan yesterday. The place was like a maze, with a jumble of shops both local and chain alike side by side. There were counterfeits and legitimate goods right next to each other. Certainly very different. My sister took me there, and if it wasn't for her I likely would never found my way around. But I digress, the thing I wanted to talk about is nail color. CND shellac, or OPI GelColor, or similar system by different brand in different names. I was told they are essentially the same thing. I am sure people who've paid any amount of attention in nail lacquer trend at all would have known about already. But just in case some of us are like my sister (who didn't even understand the difference between gel nails and simple polish), I am just going to run through it. Basically, it's a system that utilizes UV lamps to cure (is that the right word?) the special polish. It promises fourteen plus days of wear with no chipping, and super fast drying time. I have been wanting to try it for some time now, since with my line of work it's difficult to keep nail polish on. I have actually accumulated a pretty impressive array of bruises and cuts, all of them relatively minor, ever since I started in my current field of work. So with this little tiny nail salon I decided to try it. I think mine is actually not CND, but OPI. I am not even really sure about it. I have another three days off work, so I won't really see how it fares at work for a few days yet. Here is a link to Lisa Eldridge having her nails done with CND Shellac. 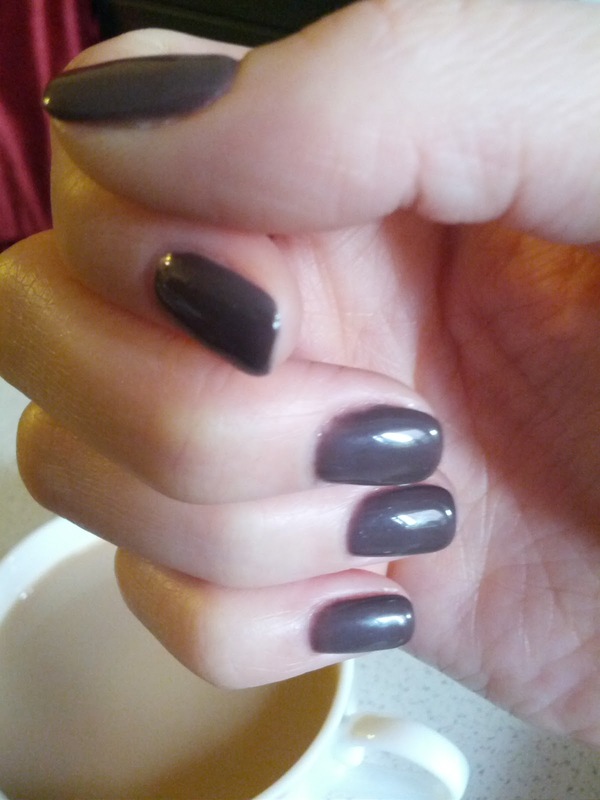 Dark nails for the recently cooled down weather. P.S. Congratulation on Tito Vilanova's so far speedy recovery! He had returned to training with FC Barcelona.